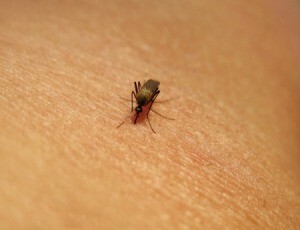 This is a guide about sulfur mosquito repellent. Sulfur powder from a pharmacy may deter mosquitos from biting. I just read about sulfur and mosquito bites. I want to know how often do you do this with the honey or even match stick tops? Every day, once a week, how long before? I have a lot of mosquitoes in my yard and hate to stay in. I want to sit on the swing, enjoy working in my yard, but have tried everything. Help. I purchase sulphur powder at my pharmacy. It should be behind the counter, if not, your pharmacist can order it for you. It is very inexpensive. I pour it into a tube sock, using a funnel to avoid spills. Fill the sock about 1/3-1/2 of the way up with the powder. Tie a knot on the top of the sock to close it. Hold the sock by the knot and beat it around your ankles and lower leg area. Store it in a ziplock bag. It should keep mosquitoes and chiggers away! Good luck! I am still trying to find out what type of sulfur to use for mosquitos and how often to use it. The pharmacy in our area does not carry any. I would like to order online. Thank you in advance. How are you wanting to use the sulfur? I have never heard of it repelling mosquitoes, although it is in fireworks, which do seem to repel them. It comes in a powder form. I am surprised your pharmacy doesn't carry it, we carry it where I work in with the first aid supplies. Farm stores also carry it as it is often used with some plants, such as blueberries. I was wondering if anyone has a recipe using sulfur, honey, and lemon juice. You take by the mouth to keep mosquitoes, red bugs, etc. from biting you. My husband's mom used this recipe, but I can't find mine. Any help would be appreciated. Simply cutting off the match heads and swallowing 3-6 it prevents mosquito bites and other insects. Ive been doing this for years. My dad taught me this trick as a kid. I swear by it.